Howard Steven Friedman is a leading statistician and health economist for the United Nations. He has worked with major organizations including UNICEF, the World Bank, the World Health Organization, UNFPA, UNAIDS, UNDP, and UNESCO. He is also an adjunct professor at Columbia University’s School of International and Public Affairs, and he formerly directed data analysis teams in the corporate world. He is the author of more than thirty-five scientific articles and book chapters in areas of applied statistics and health economics. 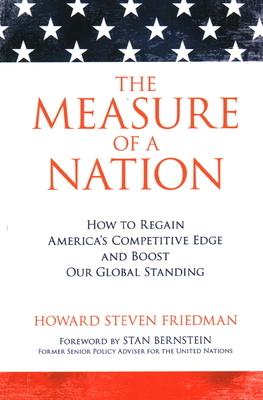 "Friedman presents a thorough, unbiased analysis of how America compares with the rest of the developed world in health, safety, education, democracy, and other quality-of-life indicators. It’s a must-read for anyone interested in seeing their country achieve greatness." "An eye-opening and revealing analysis of what America needs to do to remain great. This fact-based examination is grounded in unbiased data." "This book is a wake-up call to anyone who wishes our country to prosper." "A thorough assessment of how the United States stacks up in comparison with other affluent democracies, Measure of a Nation provides a sober picture of today and a wealth of evidence and ideas to contribute to a brighter tomorrow. Studying the successes, as well as the failures, of America’s ‘peer nations’ can give us fresh ideas for the social and economic challenges of the twenty-first century." "A persuasive and pointed analysis that holds up a mirror to America’s entrenched interests and capacity for self-deception. It exposes directly how much error and plain falsehood is found in current political and media discourse on matters of fundamental importance." "Friedman has assembled a provocative set of data that will help policy makers, business leaders, and others interested in America’s future better understand America’s relative strengths and weaknesses. I hope Friedman’s analysis will spark a clear-eyed, less ideological conversation about the many policy choices that lay ahead."